Weekend #9 – OC Fair!! and the Kitchen Floor. On weekend #9, we took a break from working 7 days a week, 15+ hours a day, to enjoy our annual trip to the OC Fair. And oh boy did we pick a scorching hot weekend to go. =)So what did we do all week to allow us this short reprieve from home improvement? The Kitchen Floor.After work, all week before weekend #9, we’ve been busy unpacking. I also have been able to carve in some time whenever I get home from my 9 to 5 grind before Kim, to work on the Kitchen Floor.Following the instructions from lovelyetc.com, I first put down painter’s tape to outline the borders. I thought this looks pretty cool already and I wanted to throw up my hands and say DONE. But I continued to the next step. I painted over the tape with the same white paint on the floor. This is important because the black paint I’m using for the border won’t bleed under the blue tape. I wish I’ve known this cool tip when I was painting walls. KT helped me remove the blue tape right after I painted the black border. We didn’t want to give the paint a chance to dry. If it did, then removing the tape will also pull up the paint around the tape. We, unfortunately, had a lot of experience with that as well. After giving the paint sufficient time to dry, I started stenciling. It wasn’t love at first sight. I wasn’t sure if I liked the stencil on our beautiful white floors with crisp black borders. So I repeated the stencil a few more times so I can get a better idea of how it looks on our floor. It just wasn’t working for me. I solicited KT’s opinion and he wasn’t excited about it either. We thought it looked too busy for such a small space. We much prefer the simple clean lines on the otherwise blank floor. But here’s our dilemma… we put in so much time and effort to make this stencil, it seems like such a pity to not use it. We decided to let it sit for a while. Mom, Lauren, and Susan dropped by after the OC Fair on Sunday. They all prefer the floor without the stencil. Susan did make a great suggestion: Just stencil a small area to define the dining area. KT and I considered it for a while, trying to figure out how big of an area that would be and whether or not we’ll need to add borders, etc. At the end, we decided to ditch the stencil. As consolation, we agreed to use the stencil for something else in the future so all that effort won’t go to waste. Sometimes it’s hard for us to ditch an idea that we thought was brilliant. I often find myself so caught up with an ideology that I disregard the reality. We had a vision of how great it looks in our “mind’s eyes” (HAHA – I love F*R*I*E*N*D*S) but I’m glad we were able to let it go. In reality, our floor looks great, IMHO. Jumping ahead, after weekend #9, I painted over the stencil and we started painting the polyurethane over the entire floor. We used the brand Varathane. We went with Gloss because we wanted the shine. One a side note, an employee in the paint department told us that this sealer is for stained wood. I double checked the directions on the can and it is safe to say she’s incorrect. This can be used for stained or painted wood. The direction also said to used a paint brush or a foam roller. We didn’t have a foam roller so we went ahead and tried it with the same roller we used to apply the paint on the floor. Not. A. Good. Idea. 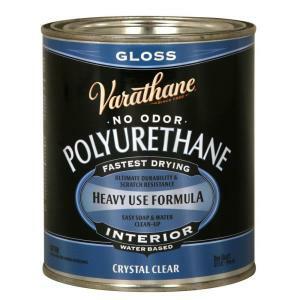 It was like we were reliving the nightmare of applying the poly on the kitchen cabinet. There were bubbles and it felt rough. I gave KT a break and decided to paint the floor with my nifty paint brush. Yea, I said “my nifty paint brush.” After ruining so many expensive Purdy paint brushes, I claimed two new ones that I take very very good care of. Surprisingly, it only took me between an hour and fifteen to an hour and a half to paint a coat of poly on the entire kitchen floor with a paint brush. After putting down the minimum of four coats of poly, I considered myself done. Hip hip hooray! Big Smile. Celebration Dance. (We still had to give the final coat a three day cure time before we can have the kitchen back for normal use). We can’t stop staring. We’re in love. With the floor. And each other of course. This entry was posted in Kitchen, Weekly Progress and tagged fair, kitchen floor, oc fair, orange county fair, painting kitchen floor, painting plywood, painting subfloor. ← Weekend #8 – All Moved Out. Kind Of.